Now, I don’t plan to yell at you like I did last Sunday. But that doesn’t mean that I’m not excited about what we’re going to study this week! I am very much so excited. 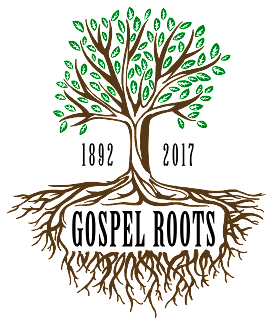 Today, we’re going to have our 9th monthly message in the “Gospel Roots” sermon series where we are re-visiting the foundational values of our church family. We have been going back through our 125-year history and surfacing the major, important things that have made us who we are. So we’ve talked about the gospel–Jesus Christ and Him Crucified. We’ve talked about singing the gospel, taking the gospel to the lost, being a praying church, being a church that stands on the Word of God, being a church that is involved in world missions, a church that loves each other as family, and a church full of servants who know that their labor in Lord is not in vain. So what is the topic for today? Here’s the title of our message for today. A number of years ago, I preached a sermon entitled, “It’s Our Middle Name!” about that hard to spell and almost as hard to read word “evangelical” or “eh-vangelical” depending on who you ask. That word means “gospel-oriented,” all about the gospel. Because “gospel” is “evangel” in Greek. 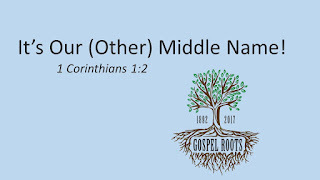 And even though it’s hard to spell and even though some people abuse the word, I’ve always been glad that it’s our middle name because it reminds us that we are supposed to be centered on the gospel. But today, I want to talk about our OTHER middle name. The middle name that is easy to pronounce and easy to spell and that our church often goes by. It’s not because we don’t take an offering! I know somebody who thought that. Because some EFCA churches don’t take an offering during the service, they just have a box in the back for putting your envelope in, this guy thought that “free” meant that you didn’t have to give anything! And if you are guest here, I hope that’s how feel when you’re here! There was actually an EFCA church out West that changed their church name because a lot of the people in their community thought that their church name meant there was no gospel there! No evangelicals. No evangel! That’s not what we mean by “free” either. The word “free” in our name actually refers to our form of church government. How we organize and direct our affairs as a church. How we are structured and ordered and governed. We are what is called “congregational” which means that we are autonomous or self-governing as a congregation. We are free of outside control. You’ve probably heard of them or even come from a church that practices a different polity than we do. Most of the different polities have some biblical basis to them. Some part of the biblical picture that those church traditions emphasize. There’s the “episcopal” structure which is kind of “top down” like the Roman Catholic Church or the United Methodists or the Episcopal Church itself. “Episcopal” comes from the Greek for “Oversight,” looking down over, watching over. And then there’s the “Presbyterian” structure which emphasizes the role of Elders (Greek, presbuteroi) where the elders in a region exercise authority over the local churches in that region. And there’s other polities out there, too. But our polity is “congregational” which means, again, that the congregation, the church membership, is self-governing. It’s not top-down. It’s bottom-up. It is “free” from outside control. Well, first, we get that from our history. Remember in the Spring, when I told you about the Lay Bible Readers Movement in Scandinavia after the Protestant Reformation? Well, we aren’t used to this, but they all belonged to the state-run church which in the case of Scandinavia was the Lutheran church. If you were born in Sweden, you were baptized as a Lutheran. That’s what you were. If you were Swedish, you were Lutheran. The church and the state were intertwined. And in many ways, the state told the church what to do. So they wanted their churches to be...in a word...free. Especially to read and follow the Bible for themselves. And when bunches and bunches of those believers came over to the United States in the late 19th century, they started up what they called “Free Churches.” Free, now, of state control. And free of any outside control, in fact. Including the control of other churches or church leaders. So that’s where our other middle name comes from in our history. But where does free come from in our Bibles? Well, that’s a little trickier. I believe it’s in there. I believe in congregationalism! But it’s not the gospel, and it’s certainly not as clear as some of the other doctrines that we believe in here. Church polity is something that genuine believers can have genuine disagreements about. But I do think it’s in there, and I want to start by looking at 1 Corinthians chapter 1, with you. Yes, that was all an introduction! I’ll bet you’re wondering what is in here today. What artifact can stand for our other middle name? Has anybody ever looked into these old books that sit on top of the history display case in the foyer? 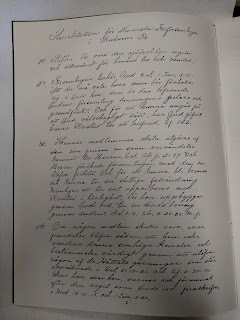 These are the record books of the Swedish Free Church of Lanse. 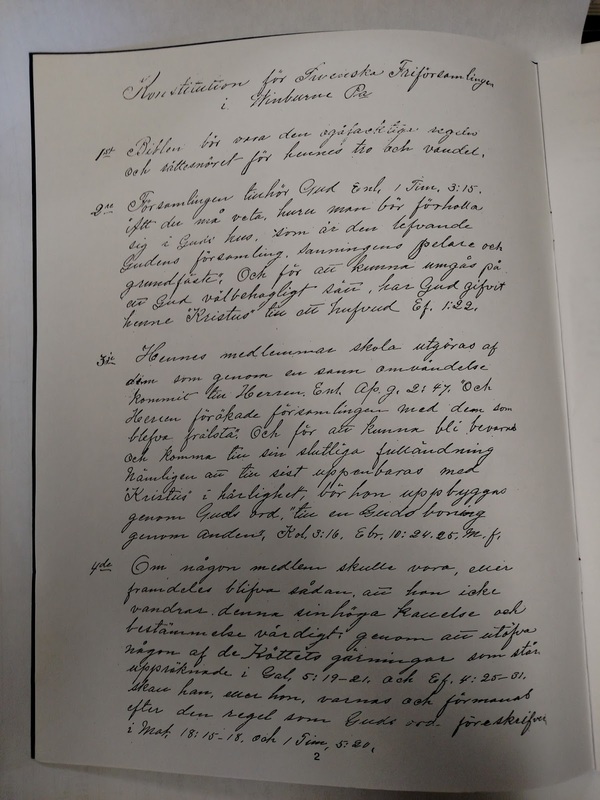 And the first entry is dated February 13, 1892. When our original 10 members gathered in the home of A.J. Palmquist, they organized themselves and took down these minutes together. This next book starts in 1905. The next two are from the 1940's. Now, where do we get that? I have four points to make from one verse today. Paul is writing to people. He is not writing to a building. He is not writing to an institution. He is not writing to a campus. He is not writing a concert or a show of some kind. Paul is writing to a group of people. Let me say something crazy right now. You cannot go to church. And...there is no Bible verse that says that you should go to church. Because church is not something you can go to. Church is something that you are. Now, we use the language that way, and that’s fine. “Go to church.” We know what we mean? Or do we. Sometimes our use of language can trip us up if we are not careful. The church is not a building. It’s not even a worship experience. A holy people. Did you see that in verse 2? That’s Paul’s short definition of a church. A people group that are made holy (sanctified) by Jesus and called to be holy by Jesus. I love that it says both of those. That Jesus both makes us holy and calls us to holiness. Jesus’ blood washes us clean and makes us holy, and the Spirit of holiness calls our names and beckons for us to live out that holiness in everyday life. And get this! That’s one of the key reasons for the church. That we would help each other to live holy lives. Jump over with me to the book of 1 Peter chapter 2. Pew Bible page #1201. Keep a finger in 1 Corinthians, but look at what Peter says about who we are. 1 Peter 2, start in verse 4. Jesus is a called a Living Stone. Which is a contradiction in terms! Absolute strength (a stone) combined with absolute life (a living stone). Rejected by men at the Cross but chosen by God and precious to Him, and look what that makes us! We are living stones, too, holy building material. Being built into a temple (a spiritual house) and...watch the metaphor change to what you find in a temple...a holy priesthood, offering spiritual sacrifices acceptable to God. Not animal sacrifices, spiritual sacrifices, our hearts. The church is a holy people. That was one of their catchphrases in the Reformation. That’s what the church is. WE are a royal priesthood. You know what that means? It means that we don’t need another mediator. Somebody else to stand between us and God. We don’t need a priest. I am not your priest! You don’t come to God through Pastor Matt. Praise the Lord! And I don’t come to God through Pastor Jeff Powell or President Kevin Kompelien. Praise the Lord! There is now only “one mediator between God and men, the man Christ Jesus...” (1 Timothy 3:15). Not me, not a priest, not a bishop, not the Pope, not Mary. Just Jesus. We are all priests! We are all privileged to come into the presence of God and to intercede for others. We are all called to help each other be holy. Not just the pastor. All of us. This church had no pastor when it began in 1892. And it was a church. A bona fide church. You don’t need a pastor to have a church. You don’t need a building to have a church. You don’t need a pastor to have a church, but you do need a holy people. Turn back to 1 Corinthians 1, verse 2. #2. THE CHURCH IS LOCAL. Paul envisions the church to be a gathered group in a certain location. The church is not the location, but it is the holy people who are connected to one another and gather with one another in a location. The church is not just all of the holy people of God. The church is also a particular group of people who are connected to one another in a certain locality. And catch this. The local church is responsible to God for what it does as a church. As this letter to the Corinthians unfolds, the apostle Paul gives the whole church instructions on how to behave, on what to do, on what to believe, on how to practice their communal life as a church family. He treats the whole church as responsible for their choices as a church. I think that’s really important for the case for congregationalism. Paul doesn’t just write to the church leaders. He doesn’t just write to the pastor of the Corinthian church. Or even just to the elders. There are some letters where he does. 1st and 2nd Timothy, Titus. Sure. But most of his letters (and most of the other epistles in the New Testament, not just the ones written by Paul) address the whole church and hold the whole church accountable for the choices that the whole church makes. Think about the book of Galatians that we’re studying right now. That letter goes to all of the churches in the region of Galatia not just the leaders. I’m sure those churches had leaders. The top leaders in most of these churches appear to be called “elders” and they are tasked with shepherding and teaching and leading these churches. But Paul doesn’t just write to them. He goes right to the people. And he holds them accountable for what the whole church chooses. If the church loses the gospel, it is the church’s fault. Now, teachers and leaders are held to a higher standard. And they have, perhaps, a deeper accountability because of their roles. But Paul does not by-pass the congregation. He takes his teaching right to them. And if the whole church has the whole responsibility for its decisions, then it makes sense that the whole church would have the whole authority it needs to make those decisions. That is the case for congregationalism. It’s not so much that we have the right to govern our affairs as we have the responsibility to govern ourselves and will be held accountable for how we do it. In verses 10-13, Paul gives the church a hard time for infighting, quarrels, and division. They were experiencing church splits over personalities and what leader they identified with. That wasn’t said to just the leaders. That was said to the whole congregation. It’s our job together to help each other be holy. And if someone will not be holy, it is our job to put them outside in the hopes that they will be restored. The church is local, and the local church is responsible for its choices. Including what it is taught. Think about that phrase about “itching ears.” Do you remember it? Is that happening? You bet. But did you notice who is responsible? The church is responsible for whom it calls to teach it, for whom it listens to. So if I teach a false gospel and keep on teaching a false gospel, you are responsible! And it’s your job to stop me. The congregation, as a whole, is responsible for choosing its leaders. Because the church as a whole is responsible for its choices, we believe it’s important that the church as whole has the authority to make all of the big choices. Now, a church as a whole can’t make all of the choices. But they should be able to make all of the big choices and any of the choices that they consider to be big. That’s what we mean by congregationalism. I serve on the Allegheny District Constitutions Board, and I read every governing document of every church that wants to join our association of churches. And one of my jobs is to make sure that every one of the churches is truly congregational in how they do things. That the congregation as a whole decides who their pastor is, who their officers are, what their budget is, what will be done with their shared property, and what their constitution and by-laws say. It’s my job to make sure that the congregation is its own highest authority. And we’re committed to that here. Now, here’s where membership becomes so important. Because if it’s the local congregation as a whole that makes the big decisions and is responsible before God for those decisions, how do you know who is the congregation and who isn’t? Some people think that membership is not in the Bible. 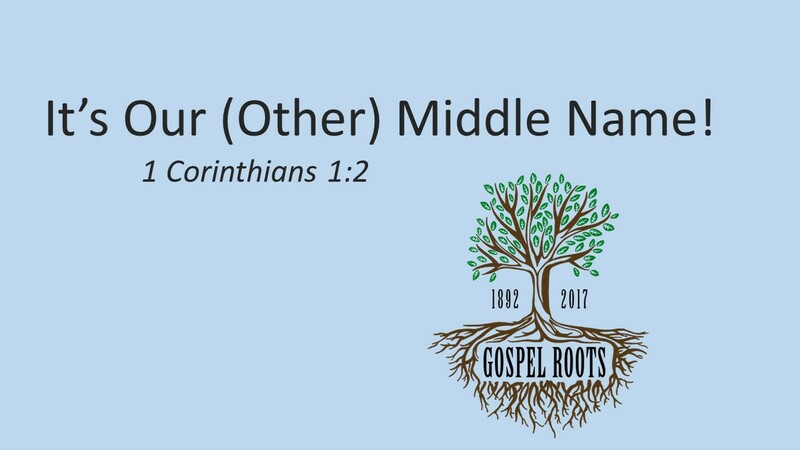 In chapters 12, 13, and 14 of 1 Corinthians, Paul unpacks his body metaphor in the greatest detail. “The body is a unit, though it is made up of many parts; and though all its parts are many, they form one body. So it is with Christ.” Right? I remember a guy who used to go here to church a long time ago, and I was always trying to work on him to join the membership. So, if I’m on you about membership, this is why. The church is local and the local church is responsible for what the local church does. #3. THE CHURCH IS GLOBAL. As much as I believe in congregationalism, in the autonomy of the local church, it must also be tempered with a bigger view of the church universal. Turn back to chapter 1, verse 2. The local church is connected to the global church. The local church may stand on its own, but it is not alone. It’s not supposed to be alone. We must stay connected to other churches elsewhere. They may not have any authority over us, but they are still us. And we are still them. That’s what the Apostle’s Creed means by saying, “I believe in the holy catholic church” not the Roman Catholic church but the holy universal big C everybody out there who belongs to Jesus Church. Catholic in that sense. We aren’t just out on our own. We are part of something much bigger than spans the globe. Some people call that "connectionalism." So we are both congregational and connectional. The EFCA is an association of autonomous but interdependent churches. We choose to relate to each other and work together to achieve our mission. This week, I’m going to a national EFCA thing and a district EFCA thing. I leave tomorrow for Minneapolis for what they call the Missional Summit where I’ll be taking part in meetings of the Spiritual Heritage Committee. Please pray for me. I’ll be seeing Kevin Kompelien there and we’ll be talking about his visit in a week and half. At the end of the week, Heather and I are going to the Allegheny District Pastors & Wives Retreat. Thank you for sending us. I’ll see Jeff and Kim Powell there and a bunch of our other district pastors. I love being connected in a family of churches that work together with a common theology and a common goal. Our church has always partnered with other churches. For while, we were an Evangelical Covenant Church. Did you know that? A lot of people don’t know that. The Evangelical Covenant Church was also Swedish and they sent Swedish preaching pastors to be among us. We owe them a great debt. One of those old Swedes is still living. Pastor Chuck Anderson. We sent him an invitation to our anniversary. We have always connected with other churches, because even though the church is local, the church is also global. And I know that I’m running out of time. Here is point #4. #4. THE CHURCH IS CHRIST’S. The church belongs to Jesus. Verse 2 one more time. The church does not belong to me. The church does not belong even to the church. The church belongs to Jesus Christ. He bought it with His blood. So congregationalism is not democracy. It is not a bunch of citizens all voting to get their way. Congregationalism (rightly practiced) is a Christocracy. It's is a royal priesthood discerning together what they believe is the will of their Lord for this church body. And the church belongs to Jesus. What is your application of today’s message for your life? I’ve given this list before, but let me just say it quickly. 1. Be a part of the church. If you have not yet joined the membership, you need to seriously consider it. It’s biblical, and it’s what kind of a church we are. We just had a membership seminar with a bunch of young adults at it, and we’re going to have another soon. 2. Do your part in the church. Take up the mantle of membership. Use your gifts in ministry. It takes the whole church to be the church. Don’t just GO to church. You can’t go to church! You’re a body part. Don’t sit out there like some detached body part. Get into the game. The nominating committee is beginning their work of finding officers for the congregation in 2018. Pray for them and consider how you could be used. 3. Never part from the local church. You can leave this one. Nobody’s locked into this local church for life. But don’t try to be a Lone Ranger. We aren’t meant to go it alone in the Christian life. We are meant to be a part of the local body of believers and help each other to live Christ-pleasing lives. Because Jesus is the Head of the Church. We are NOT free from Jesus! 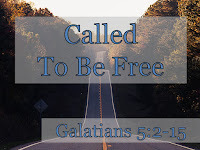 [Matt's Messages] "Called To Be Free"
We’ve reached the climax of the letter the apostle Paul wrote to the churches in the region of Galatia. We’ve called this letter a “tornado warning” (after Timothy George). He has pulled out all of the stops. Paul is really concerned for these people. Have you felt it as we’ve gone along? Do you feel how perplexed and vexed and worried and concerned Paul is for these Galatians? He knows them personally. He brought the gospel of Jesus Christ to them and they received him as a messenger from God. But now...now they are flirting with a false gospel! Some trouble-makers, some false teachers, some agitators have infiltrated the Galatian churches and whispered a false gospel in their ears. What is it? The false brothers have been saying something that sounds good, but really isn’t. They’ve been saying that believing in Jesus is okay, but to be truly right with God in the end, you need to also take on the Law of Moses. You need to do the works of the Law to be justified, to be counted righteous before God on the last day. And, according to the teachers, the next big step in observing the Law is being circumcised. No. They were Gentiles. They didn’t grow up with circumcision. They didn’t grow up with the Law like the Jews did. And these folks have come along like the people in Acts chapter 15 and said, “Unless you are circumcised, according to the custom taught by Moses, you cannot be saved.” (15:1). And so the Galatian churches were considering circumcision for their male members. And that’s what he’s been doing. Four whole chapters of it. He’s made various arguments from his own testimony, from his interactions with the apostle Peter, from the Law itself, from the book of Genesis, from the story of Abraham, from the whole-Bible logic of trying and failing to keep the Law versus the paradoxical biblical logic of the Cross. The logic of justification by grace alone through faith alone in Christ alone. Word by word, Paul has been building his case, trying to show the Galatians how foolish it would be to add law-keeping to the foundation of their justification. It would be going backwards. It would be like going from Son back to Slave. And last week, his argument culminated in the clarion call of Galatians chapter 5, verse 1. Those words signal that Paul has reached the “therefore section” of his letter. You know how Paul normally sets up his letters with deep theology at the beginning and then the implications of that deep theology at the end. I often call it the “So What” section. If this is true, then so what difference does it make. Now, Paul has been saying it all along, but he’s going to lay it on thick from here on out. This is about freedom! And it’s about not getting ensnared and enslaved once again. Today, I’m going to read to you verses 2 through 15. And here we come to the strongest words that Paul, perhaps, has ever used. And he uses them in the service of the gospel. He uses these strong words in the service of gospel freedom. He means free of the Law, free of Lawkeeping, free from the Law’s authority and the Law’s demands and the Law’s condemnation. Because of Jesus! In my line of work, I end up going to a lot of funerals. I have led a bunch of funerals, at least 75, and I’ve attended a lot more than that. What do you want said at your funeral? When you’re down there in the casket, and the preacher or someone is up here making a speech about you. You hear a lot of strange things said at funerals. As someone tries to sum up a life in just a few words. What do you want said at your funeral? About you and heaven. Do you want them to say, “He sure did life good. He has surely obligated God to reward him with eternal life. He was a great man!”? Or do you want them to say, “He trusted in a great Savior!”? What do you want God to say? Forget the people at your funeral. What do you want God’s verdict to be on your life? That’s what Paul is talking about. That’s the stakes here. He’s using all of that apostolic authority that we learned about back in chapter 1, and he’s using it all right now. And he’s using it to say in very strong terms what he said in verse 1. If the people at your funeral say, “He was circumcised, that’s what he was trusting in,” if you say to God at your judgment, “I was circumcised, that’s what I was trusting in...” then Christ will be of no value to you at all. I believe He died on the Cross for our sins and all that stuff. But I had to do my part! So I got circumcised. And I began to the keep the Law. Do you see what’s at stake here? This is not a little thing. But Paul says it’s the just the opposite. No. Paul was circumcised himself, wasn’t he? He’s not against being circumcised. He’s against taking on the sign of the Old Covenant in your flesh as a sign that you are taking on the Mosaic Law and promising to keep it and trusting in keeping it for your right relationship with God. And telling everybody else that they have to do it, too! Apparently, they haven’t yet gone this far. At least, as far as Paul has heard. I don’t know if they’re telling you this or not. They might be keeping it from you. But I’m telling you. If you go this route, you are taking on the whole law, and nobody, but Jesus, has ever been successful at keeping the whole Law. If you go down this road, then you are cut off. And not just your foreskin. You are cut off from Jesus Christ. You will be out of the sphere of grace. Because you’re choosing Law over grace. Paul would just absolutely hate it if any of the people he loved took that road. I would hate it if this was said at my funeral. Woe to the one whom that is said at their funeral, or much worse, in the courts of heaven. Isn’t that a glorious sentence?! Notice how the pronouns change. He changes from “you” those people who are maybe going the wrong direction, to “we” and he gives us the gospel. Salvation is by faith, not by works, so that we cannot boast. Salvation is by faith, our trusting in Jesus’ work on the Cross. Giving us the righteousness that we need. Both now in present justification and someday soon in final justification. That could mean the hope that comes from the righteousness we have in Christ. Because that’s a real thing. But I think it actually means the righteousness, the right standing with God that we will have on that day. The true righteousness and the visible righteousness of Christ that we are will be clothed with on the last day. That doesn’t come from our works. That comes from Jesus’ work on the Cross and the Spirit’s work of faith in our hearts. That’s the gospel! That’s how it works! Notice that he doesn’t say we should boast in being NOT circumcised either. You can’t trust in your uncircumcision either. What counts in Christ is FAITH. And is your faith in Christ alone? Don’t leave here today with that question unsettled. “His faith worked by love. His faith was the root and love was the fruit. Paul is going to say more about that in a few more verses. You were good off the blocks. Why did you let that guy into your lane? “Who has bewitched you?” Right? One bad apple ruins the barrel. You’ve got to stop listening to this false teaching. It’s going to blow up the church! Paul believes that the Lord will use his warnings in this letter, to draw these people back from the edge of the cliff. And those who are pushing them toward the cliff, will fall over it. No matter who they might have been. Paul is hopeful, in the Lord, that these dire warnings will be effective. And he is confident that God will judge the ones making the trouble. Apparently, they’ve been saying that Paul is inconsistent on circumcision himself. The rumor is going around that Paul preaches circumcision, at least for the Jews. But you can tell by who is being persecuted what gospel they preach. Paul is not preaching circumcision and Law-keeping for anybody as a means of justifcation. He is preaching the Cross. He was preaching the Cross. And he is preaching the Cross. And he will continue preaching the Cross. And the Galatians have to choose. Which will it be? How do you answer that for yourself? The Cross is offensive, according to verse 11. The Cross offends our pride, doesn’t it? You know what that Cross says about you? It says you are not a good person. It says you are a sinner. It sure doesn’t make you feel good about yourself. Circumcision makes you feel good about yourself. You added to your salvation. Jesus did his. You did yours. The offense, the scandal, of the cross has been abolished. You did something to help make up for your sin. What a good person you are! That’s what circumcision would have done in this situation for these people. And they had to choose. Circumcision or the offense of the Cross? These bad guys were choosing circumcision and they were teaching that all of the Galatians had to choose it, too, or they weren’t going to be right with God. They weren’t going to heaven when they died. They weren’t getting into the kingdom of God without getting circumcised. And that’s a different gospel. And it’s really no gospel at all. Yes, he said that. And he meant that. And it was a holy thing for him to say. That’s like the pagan religions that mutilate themselves. That kind of religion is no better than the pagans. It is non-Christian, no matter what these people call themselves. If that is what they will teach, let them be cut off. Physically and spiritually. Let them be damned. He doesn’t say that lightly. If it is sarcasm, it is the heaviest and holiest of sarcasm. That which is an imprecation. You weren’t called to be a slave to the Law. You weren’t called to be a slave to the Law’s demands or the Law’s condemnation. And here Paul turns a corner and begins to run a little bit of a different track from here to the end of the letter. He’s made his case and he’s made his appeal. Don’t go back to slavery. Trust in Jesus Christ alone for your justification. His work on the Cross is more than enough to save you. But don’t get wrong idea. Just because you’re free of the Law doesn’t mean that you are free to do just whatever. It means that you are now free to be holy. And you are free to love. You are free to live a life of love. You are free to serve others in love. You are free to become a slave! A slave, not of the Law or of sin, but a loving slave to serve other people and put their interests ahead of your own. Get this. Look at verse 14. So we end up fulfilling the Law after all. Not doing the Law, not keeping the Law for our justification, but fulfilling the Law, living out what it was trying to teach us all along. And here, love for our neighbors. And we are free to love each other in Christ. By the way, that’s what trying to be saved by law-keeping will do to a local church. Legalism will make a church the most toxic, people-destroying place you ever saw. That’s not the kind of freedom to which we are called. Gospel freedom is freedom from the Law. And freedom to serve each other in love. Next time, Paul will begin to develop this idea of faith working through love. And walking by the Spirit and how that produces the Spirit’s fruit in us, which is love. I have not been set free for selfishness but for service (paraphrasing John Stott). Whom am I called to serve today? Not because I had to be a servant to be justified. But because I was justified, because I was set free. I had been set free to love. And people could see it. Hear the warning in this passage and heed it. There is only one way of salvation. And it is not by our works, our human achievement, our religiosity, our goodness. It is only by faith in Jesus Christ. Every other way of getting to God will cut you off from God. And everyone who teaches another way of getting to God pay a steep price. Trust in Jesus Christ and Him alone to be set free. And use your freedom to serve others in love. 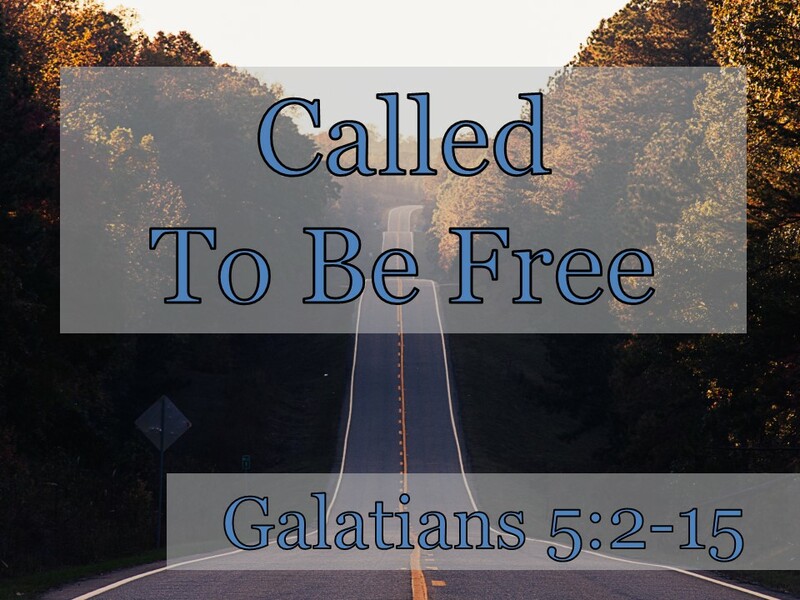 Because, brothers and sisters, you have been called to be free. Q&A with Mike Emlet on "Descriptions and Prescriptions"
The folks from New Growth Press asked Michael Emlet some good questions about Descriptions and Prescriptions, the new release which I've been featuring on the blog this week. Why did you write Descriptions and Prescriptions? When it comes to issues of psychiatric diagnoses and medications it is too easy for Christians to go to one extreme or the other. That is, to either grant too much authority to psychiatric classifications and solutions for people’s problems as though Scripture is irrelevant for issues of mental distress. Or to dismiss them altogether as though medical science is irrelevant for issues of mental suffering in Christians. I wrote this book to present a nuanced “third way” between those two extremes that is grounded in Scripture, does justice to human beings as embodied souls, respects the role of scientific inquiry, and suggests compassionate and wise ways to minister to those who are struggling with mental illness in our churches. How do you think your medical background and ministry training/experience contribute to the shape of this book? My training and experience in both medicine and gospel ministry means that the book is first and foremost grounded in Scripture while also giving careful consideration to the medical research that contributes to the discussion. The book is marked by both biblical and scientific inquiry. My primary audience includes helpers and leaders in the church--pastors, vocational counselors working in a church setting, lay counselors, elders, deacons, small group leaders, and others involved in one another ministry. I trust the book will be helpful also for Christian psychiatrists, Christian psychologists, and Christian professional counselors. What are the takeaways of your book? For readers who come skewed to one extreme or the other regarding psychiatric classification and psychoactive medications, I hope they leave with a more balanced and nuanced approach. For readers who already have a more balanced approach, I hope they leave more clearly informed and equipped with biblical and scientific perspectives to undergird their ministry. Ultimately I want the perspectives of the book to provide helpers with guidelines for compassionate, wise, gospel-saturated care to those who are struggling with issues of mental health. What imbalances have you seen in the way Christians think about psychiatric diagnoses and medications? Regarding psychiatric diagnoses, I have encountered people who embrace a psychiatric label as an all-encompassing explanation for their struggles. Their diagnosis becomes the identity around which their lives orbit. They may seek only medical means of help and believe that biblical and pastoral realities are irrelevant to their problems. On the other hand I have seen people who resist a particular diagnosis when it might provide a helpful way to bring some clarity and order to their experience. These people may over-spiritualize their problems and resist appropriate medical interventions. Since God has made us both body and spirit creatures, it is important to consider both aspects of our personhood as we seek to understand the struggles of others. What are some limitations and benefits of a psychiatric classification of people’s struggles? The main limitation of a psychiatric classification is this: it is a description of the person’s experience but it is not an explanation for it. A diagnosis describes the person’s disordered thinking, emotion, and behavior but doesn’t tell you why the person is struggling in this particular way. The Diagnostic and Statistical Manual of Mental Disorders (the DSM) acknowledges this limitation. This means that a diagnosis becomes a starting point (not an endpoint) for careful inquiry, biblical understanding of this person as a body-soul image bearer, and ongoing pastoral ministry. At the same time, certain psychiatric diagnoses (for example, schizophrenia or bipolar disorder) alert us to patterns of severe suffering that may well require additional intervention, including medication. How does Scripture give us a framework for understanding various forms of mental suffering? Our starting point is Scripture because we cannot understand ourselves apart from God’s revelation to us. God created us as body-spirit image bearers who perfectly reflected His design for abundant and fruitful life (Gen 1:26-28; Gen 2:7). Body and soul worked seamlessly to honor and glorify God. 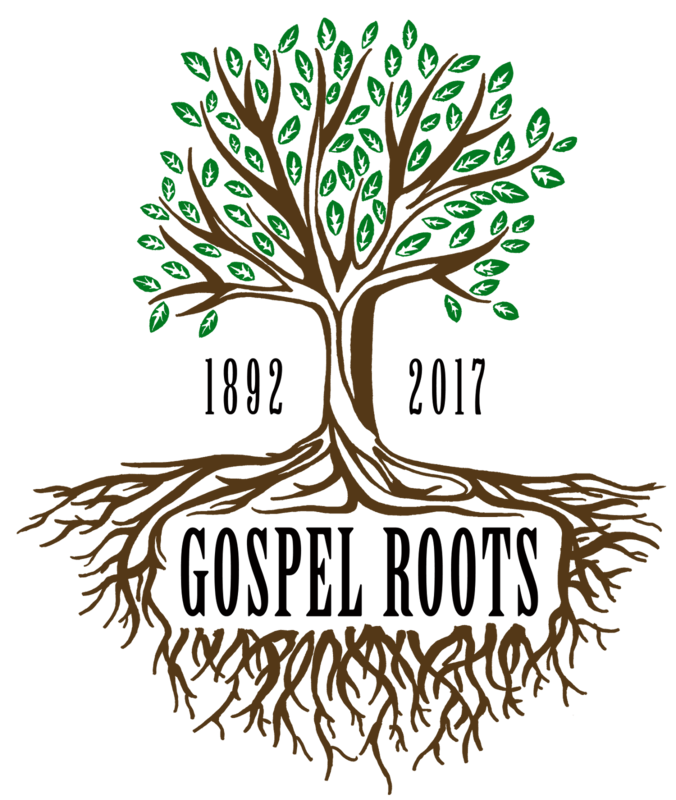 The fall of Adam and Eve into sin affects us holistically—we are fallen, body and soul. Sin and suffering (physical and mental) become two ever-present realities for us as a result (Gen 3:16-19; Gen 6:3-7; Rom 5:12-21; Rom 8:22-23; 2 Cor 4:7-12). There is no doubt that our cognition, our affections, and our will to act must and do reference the living God—we are by nature worshippers, according to Paul in Romans 1. The human heart is always active (Gen 6:5; Exod 25:2; Lev 19:17; Deut 6:5; Prov 13:12; Prov 14:13; Ezek 36:26-27; Matt 15:10-20; Luke 6:43-45; Eph 6:6; Heb 4:12). So while mental illness is suffering, it is also demonstrative of an active posture before the Lord—we remain image-bearers, after all! Our thoughts, emotions, and actions reveal an orientation toward or away from him, moment by moment. To ask, as Scripture urges us, “What does the call to love God and others look like in the midst of your suffering?” is a profoundly humanizing question. At the same time we must recognize the mystery involved in the interface of body (brain) and spirit. Scripture doesn’t slice and dice people into bodies and spirits per se, but approaches God’s people holistically as saints who need confirmation of their identity in Christ, sufferers who need the consolation of God, and sinners who need loving correction of their wayward ways. Ministry to anyone with a psychiatric diagnosis always involves these elements in various measures (1 Cor 1:1-9; 1 Thess 5:14). 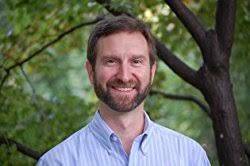 How does Scripture guide our thinking about the use or non-use of psychoactive medications? If the local church embraced the ideas in your book, what would change? My hope is that leaders in the church would have increasing confidence to pursue those in their congregations who are struggling with mental health issues. And that they would do so in a balanced way, being attentive to both spiritual and bodily aspects of these struggles. I want them to have a growing conviction that Scripture speaks broadly and deeply to the disordered thoughts, emotions, and behaviors associated with psychiatric diagnostic categories, and that Scripture provides fundamental ways of understanding people that are much more full-orbed than a diagnosis can capture. At the end of the day my goal would be a restoration of the local church as the central locus of care for those who are troubled, while recognizing there are times when we must wisely partner with those in the medical community. How can leaders in the church become better equipped to minister wisely to those diagnosed with psychiatric disorders? The most fundamental starting point is to listen deeply to people and to Scripture. Both are critical. Listening to people’s stories without an accompanying biblical perspective will result in truncated, imbalanced ministry. Listening to Scripture without listening to people’s experiences will also result in short-sighted and imbalanced ministry. Always ask, “How does Scripture provide clarity and coherence to this person’s struggle as a body-soul image bearer?” But do so, making sure that you have sought to understand the struggler’s experience as well as possible. In addition, the Christian Counseling and Educational Foundation (www.ccef.org) provides a wealth of resources to equip leaders in the church, including blogs, podcasts, videos, conference talks, mini-books, books, online classes, and The Journal of Biblical Counseling, to name a few. Can you tell a story that illustrates the balanced approach you are advocating in the book? I knew a man in my former church who struggled with paranoid schizophrenia. Despite the use of multiple medications, he continued to have bouts where accusatory voices filled his head, telling him that he was worthless and that he ought to kill himself. What did he need? Fine-tuning of his medications? Certainly that was something important to pursue, given the complexity of his psychoactive medical treatment. But I think what he also (and perhaps especially) needed at those times was a friend. A friend who would listen with compassion and patience. A friend who would take seriously the impact of those demeaning and frightening voices in his head. A friend to remind him of God’s favor, care, and presence in his experience of isolation, confusion, and loneliness. A friend who would pray for him and read the Psalms with him. A friend who would highlight that, in Jesus, nothing could separate him from the love of the Father (Romans 8:38-39). A friend who expected both personal and corporate benefit from having this man as a part of the body (1 Corinthians 12:21-26). You can be that friend. I can be that friend. And that’s apart from having any particular medical expertise with schizophrenia (which of course he needs as well). There’s the balance: by all means seek psychiatric input/medication when it seems justified but approach the person with biblical categories in mind, confident that God speaks into the experience of suffering. My film-making friend Spencer Folmar* has a brand new feature-length movie coming out in just 3 weeks. It’s called Generational Sins, and I was privileged to attend a special advanced screening. Generational Sins is Spencer’s best and most artful production so far. I can’t begin to imagine what kind of work goes into directing a major movie project like this–shepherding all of the complex details from the idea stage all the way to the big screen. The two principal actors clearly know what they are doing. Daniel MacPherson, who plays the central character of Drew Caldwell, is an Australian actor who will soon be appearing in Disney’s A Wrinkle in Time. He shows a great range in this film from outright rage to peaceful joy. His co-star, Dax Spanogle, who co-wrote the screenplay with Spencer, portrays Drew’s brother Will Caldwell and reminds me of a young Chris O'Donnell, with pluck and charm (and maybe some hidden depth). A minor character is played by the man famous for being Goofy (yes, that Goofy!). Many of the other actors are familiar faces to me because they are actually neighbors and friends from around here in Clearfield County, Pennsylvania where most of the story takes place. It’s fun to see all of them (including a sweet little girl from our church family) and lots of our local landmarks, especially some great aerial shots! Spencer himself even pulls a Hitchcock and shows up in his own movie as a waiter at a local eatery. As you might guess from the title, this movie deals heavily with spiritual and theological themes. Spencer is a Christian and has a deep desire to portray the glory of the gospel of Jesus Christ in his films. In one key scene in Generational Sins, a compassionate pastor explains the good news explicitly, referencing the death and resurrection of Jesus and the power of forgiveness to change a person’s life. And there is a general (yet realistically zig-zaggy) movement in the story arc from darkness to light. Spencer’s theology is orthodox. Unlike some other big-budget faith-based movies, there is no heretical false teaching to be worried about in Generational Sins. That doesn’t mean, however, that Generational Sins is a movie for every person to watch. Spencer is trying to create something different than most other Christian films out there these days. He calls his new genre “hard faith” movies, films that go to greater lengths to fully depict the brokenness of our fallen world. You can look at the line-up of movies that Spencer intends to make and see the kinds of heavy subjects he wants to interact with through his art. Generational Sins is rated PG-13 and for good reason. It is intense, dark, and gritty. The main characters are unhappy, unlikable, and angry with each other and God for most of the movie. The story revolves around jagged realities like child abuse, rage, lust, addiction, fear, and suicide. And there is a good bit of crass and coarse language from beginning to end (even from the saintly mother character!). If your conscience won’t allow you to watch other movies like that, you’ll want to give this one a pass, too. This week, a group of Christian women asked me if I thought they ought to attend the world premiere of Generational Sins. They had gone to other movies in the “faith-based” genre like God’s Not Dead, The Case for Christ, and War Room. I told them what I’ve written here–that Generational Sins is like those movies in being explicitly Christian, but it’s also significantly unlike those movies in both content and style. Ultimately, they decided to split into two groups that night: one that went to the movie prepared for what they’re going to see and another that is going out together for dessert and fellowship. I thought that was very wise. Generational Sins will open in US theaters the weekend of October 5-8. *Spencer was the genius behind the camera and the computer for the Resisting Gossip Trailer and Video Teaching Series. ... Amy M (whom I believe is also an M.D.)!!! 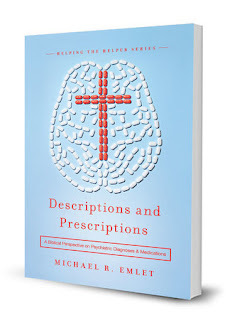 Congratulations on winning a copy of Descriptions and Prescriptions by Michael Emlet, M.D. Send me your address so that the generous folks at New Growth Press can send you your free book. Thank you, everyone who participated! If you want to buy your copy, visit WTSBooks, New Growth Press or any other book retailer today. Mike Emlet, M.D., was one of my favorite CCEF teachers when I did my doctorate at Westminster Theological Seminary. Soft-spoken yet passionate, nuanced yet not timid, brilliant yet not proud, Mike taught me so much in his class on Counseling and Physiology*. I draw from the framework he provided us nearly every week in my pastoral ministry. I'm excited that that framework is now available to everyone in a short book he has written entitled Descriptions and Prescriptions: A Biblical Perspective on Psychiatric Diagnoses and Medications which just came out last week from New Growth Press. What's amazing to me is that the book can be so helpful on these complex issues while being so short! I haven't been able to read the whole thing yet, but I appreciated this review by Phil Monroe, a professor of Christian counseling whom I highly respect. And the breadth of endorsements is impressive and encouraging. This is a really good book by a highly qualified author. Starting today, I'm offering starting a contest to win a copy of Description and Prescriptions. The good folks at New Growth Press will send a copy to the winner picked at random. You can also increase your chances of winning by posting about this contest on your social media page (FB, Twitter, Blog, Pinterest, etc.). Just send me an email or leave a comment with the link so that I know that you've expanded the reach of the contest. For each time you link to the contest, you get your name added to the hat one more time (limit of 7 chances, the contest ends at 11:59pm EST on Thursday night, September 14th). I'll announce the winner on Friday. *Mike was also one of my official readers at WTS for my doctoral project and one of the first endorsers of Resisting Gossip. He has been a great encourager to me! CCEF Paper Counseling and Physiology - Where Is the Mango Princess? [Matt's Messages] "Abraham Had Two Sons"
Our current series is called “The Truth of the Gospel” because that’s what Paul was trying to preserve for and in the Galatians. The Galatian churches, founded by Paul himself, were on the brink of spiritual disaster. False teachers had snuck into these churches and had just about convinced the Galatians to believe a different gospel than the one Paul had taught them. The Galatians were being taught that they had to add keeping the Law of Moses to their faith in Jesus to be right with God. These Gentile Galatians were being told that they had to get circumcised. They had to eat kosher. They had to observe special days, months, seasons, and years. They had to obey the Ten Commandments to be justified and to stay justified. And for four chapters, he’s been trying to convince them that believing this alternative gospel would be disastrous for them. Ruinous. He’s come at it from lots of different ways. Last week (in verses 11-20), he pleaded with them. He reminded them of their long warm history together and warned them that the false teachers were just flattering them for their own selfish purposes. And he opened his heart to them about how perplexed and concerned he was for their spiritual well-being. And Paul is not done trying to win the Galatians back to the truth of gospel of grace. In this next paragraph, he takes yet another tack. He goes on the offensive against the false teachers and takes the battle right to them. And he goes back to Father Abraham. Paul is a careful and deep student of his Old Testament, and he knows that the false teachers must had been drawing heavily from their Old Testaments. Especially the Law, the Torah, the Pentateuch, the first five books of the Old Testament. So Paul goes back to the Old Testament, back to the Pentateuch, back to Father Abraham, whom they were undoubtedly proud to be connected to, and shows again how Abraham’s story proves the truth of his gospel, not theirs. And he does it in a very surprising, unexpected way. Paul has already talked about Abraham’s faith in the promises of God and how they came before the Law. But now he draws from another story in Abraham’s life. And I would have never thought to do it this way. He draws from the story of Abraham’s first two sons. I’m going to call this sermon, “Abraham Had Two Sons,” from verse 22. Of course, Abraham ended up having more than just two sons, but these two sons were the two potential heirs of all of God’s promises in the Abrahamic Covenant. That word “heir” has been pretty important in this letter so far, hasn’t it? And these two potential heirs were two very different sons because they came from very different mothers in very different ways. And Paul sees in these two sons a recognizable pattern that appears again and again in the Bible and corresponds to the two different gospels that are duking it out in the Galatian churches in Paul’s day. It’s very surprising and little hard to follow, but the upshot is very obvious. It’s the same upshot that has been running through this whole letter. And Paul spells it out verse clearly in verse 1 of chapter 5, so we will read through to that as our conclusion this week. Before we try to understand Paul’s argument here, I think it would help to back up and remind ourselves why this whole thing is so important. I mean, Paul obviously thinks it’s important or he wouldn’t go to all of this trouble to make these arguments. What is he so concerned about? He’s concerned about the truth of the gospel. Remember the gospel is the power of God for salvation (Romans 1:16). Salvation comes from believing the gospel. What happens if you don’t have the gospel? What if you believe the wrong gospel? You don’t have the power of God for salvation. Paul is afraid that these Galatians are going to throw out the truth of the gospel for legalism and the results will be spiritually disastrous. And that’s not just for the Galatians. We need to get the truth of the gospel right so that we have the power of God for the salvation of all who believe. You want to talk Old Testament? You want to talk Torah? What are the names of those two sons? Do you know this story? What was the name of Abraham’s first son? Ishmael. Right. What was the name of his mother? Hagar. What was the name of Abraham’s second son? Isaac. Who was his mother? Sarah. Which of those mothers was a slave woman? Hagar. Right. So Sarah was a the free woman. Do you remember the story of how their births came about? It’s not a pretty story. It’s kind of like a Soap Opera or an episode of Jerry Springer or Doctor Phil. If you have time, go back and read Genesis 16 through 21 this afternoon and refresh your memory. Basically, Abraham married the slave woman Hagar and had a baby by her because of unbelief. It was actually Sarah’s idea! Which of these two ladies had been promised a son? Sarah had. But ten years had gone by and she was 90 years old and she didn’t really believe that God was going to do it. I think that’s what Paul means by saying that Ishmael was “born in the ordinary way” or “according to the flesh.” Now that “flesh” could mean born through physical means or even by sinful means. “Flesh” is used in both of those ways. But I think Paul is emphasizing that Ishmael was born by these people taking matters into their own hands. Ishmael was conceived by works. By doing. Not by faith. Not by trusting in God’s promises, but by the opposite. By making God’s promises come true by forcing His hand through their efforts. See what he contrasts it. Verse 23 again. Not by works but by faith. Not by what God does but by what these people did. But when Isaac came about, he was the result of God’s promise. He was a gift. He was grace. He was not what Abraham or Sarah deserved. Clearly! But He was what God had promised. Now, Paul makes a big deal out of their social statuses. Of the mother. Which mother was a slave? Hagar. And Paul has been harping on this idea of slavery. Hasn’t he? Look where he goes with it. Verse 24. It’s easy to get lost at this point. Especially if you have a translation like the King James or the ESV that uses the word “allegory” in that verse. The Greek word is “allaygoroumena” where we get our word “allegory” from and it means to use one set of things to speak of another set of things. Like maybe a parable or something. The greatest allegory in English literature is Pilgrim’s Progress. A fictional story where everything stands for a spiritual reality. But that’s not how Paul is using the word here. He is using one set of things to speak of another set of things but the first set of things is historical and real. Paul discerns a real recognizable pattern here in the Bible that he then lines up all of the points of correspondence so that we can see the pattern for ourselves. That’s what he means by “allegory” here. It’s stronger than the old NIV makes it. It’s not just that these thing can be taken figuratively. It is that these things are to be seen as lining up in this way. That’s why the 2011 NIV says, “These things ARE BEING taken figuratively.” Because they do represent a recognizable pattern. Hagar stands for the old covenant. The Mosaic Covenant. The Law that was given at Mount Sinai. Now THAT would have flabbergasted the false teachers! They would have never associated themselves with Hagar. Not in a million years! Because Hagar’s children come from the flesh (according to the flesh, according to works and getting things done for God), and they are slaves. They love the Law and the Law does not free. The Law actually makes slaves. Not because the Law is bad. We always have to add that. But because we are sinners, and we can’t keep the Law. The Law shows us that we need Christ. But it doesn’t justify us. Because by works of the Law no one will be justified. And if you add Lawkeeping, you will be slave. Jerusalem should be the center of faith, but that’s where the Lawkeeping trouble is coming from. Now, those are fighting words. I’m sure that they would have infuriated the false teachers who had infiltrated the Galatian churches, but they needed to be said. Legalism is a false gospel, and it enslaves. He’s lining up Sarah (when she’s got her faith on!) and the heavenly Jerusalem, the Jerusalem that is still to come, the people of God who believe the promises of the Abrahamic Covenant and the New Covenant ratified by Jesus’ blood. And he says, that’s all us. If you believe the gospel of grace in Jesus Christ, you belong to this side of the column! Do you see how he’s got everything in columns? In the one column is Ishmael, Hagar, the flesh, Sinai, the Law, the Old Covenant, the present Jerusalem, slavery. In the other column is Isaac, Sarah, the promise, the Jerusalem above, the New Covenant, and freedom. And he’s asking: Which one do you want? And he pulls out another stop in the Old Testament. Isaiah 54, verse 1. Now, that’s from a different time period. Isaiah is prophesying to the people of God in exile. And he’s promising them that even though it looks like they are barren (Jerusalem was destroyed) God had plans for a great reversal. He is still going to bring all of His promises to fruition. The exile will end and through the suffering of the Servant, there will be massive blessing unleashed on the people of God. I think Paul draws from this Isaiah here because in the context it talks about Sarah and she also was a barren woman who was eventually given a promised child over against a woman who temporarily had the affections of her husband. The point is that God is in the business of surprising people with the miraculous keeping of His promises and bringing blessing where it never seemed possible. Even from the suffering of Jesus on the Cross! “Be glad, O barren woman” because you’re going to have a baby when you least expect it. If you put your faith in Jesus and Jesus alone. Do you see how Paul is dead set on helping these people to see who they really are? You’re on this side of the ledger! Just because you’re on the right side of the ledger, doesn’t mean that it’s all a bed of roses. Ishmael mocked Isaac and gave him a hard time in Genesis chapter 21. It’s part of the consequences of sin that these conflicts come. Those who are legalists and are trying to be justified by their law-keeping will not like it if you hold to the gospel of grace. So in the short run, you’re going to have trouble. Don’t be surprised if you believe the right gospel and have a very hard life. Don’t expect to have your best life now. Jesus said to expect trouble. Paul says elsewhere, “everyone who wants to live a godly life in Christ Jesus will be persecuted” (2 Timothy 3:12). That’s what happens to those who believe the false gospel of law-keeping. Do you see what’s at stake? Paul quotes Genesis 21:10 which were Sarah’s words (perhaps sinfully motivated), but were authorized in the end by the Lord Himself (cf. Genesis 21:12). Two points of application this morning. They’re both the logical conclusion of Paul’s allegorical argument from Genesis. #1. STAND FIRM ON CHRIST ALONE. Believe that and live free! Stand firm on Christ alone. You are a child of promise. You are child of the free woman. You are a citizen of the Jerusalem above that is still to come. I love that Paul gets that from a very careful detailed study of the Old Testament. There is so much in the Old Testament to get. We will never exhaust the riches of our Bibles. Especially if we don’t study them! I can’t believe how many professing Christians don’t bother to read their Bibles carefully. Look what Paul found just by reading his Bible! God doesn’t help those who help themselves. That’s not in your Bible! Don’t do things the Hagar way. Trust in Jesus Christ and Jesus Christ alone. Trust in the Suffering Servant and the Suffering Servant alone. So that we are free! Have you put your faith and trust in Jesus Christ and Him alone? Like a 90 year old barren woman who then miraculously gives birth in total joy! Live out of your identity in Christ. Remember what column you are in and live like it. Stand firm in Christ alone. Don’t go back to sin. And don’t go back to the Law. Don’t trust in Law-keeping for your justification! You want to be tossed out on your ear? You want to be associated with Ishmael? I’m sure that rankled the false teachers! To be lumped in with Hagar and Ishmael when they surely saw themselves as the heirs of Abraham and Isaac. But they weren’t. They were the children of the slave woman. Because they were choosing slavery all over again. Don’t go back to sin, don’t go back to the Law, don’t go back to the elementary principles of the world. Put your faith in Jesus Christ alone and stand right there. Paul is not done yet. He has some of the strongest words he ever written yet to come. Next week we will look at that. At more of the consequences that come when you go back to slavery. That’s why Paul is worked up. Because this is all important. Who and what you are trusting in for your justification before God is very important. Don’t trust in your own obedience. Don’t trust in your church-going. Don’t trust in your relationship with some organized religion. Don’t trust in your good works. Don’t trust in your law-keeping. Trust in Jesus Christ alone and what He did for you on the Cross. Because that’s where freedom is. Four Years of "Resisting Gossip"
[Matt's Messages] "I Plead With You"